but now viewable in Great Detail. Northern Half of Beijing Municipality. Shisan Ling 13 Ming Ming Dynasty Tombs at the foot of the Jundu Mountains and The Badaling Great Wall of China, nearby at the Juyung Pass 20 kilometers away. 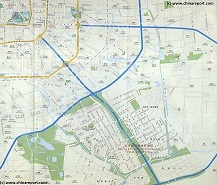 The Six Outer Suburbs of Beijing are in clockwise direction Changping District (昌平区: Chāngpíng Qū), Shunyi District (顺义区: Shùnyì Qū) - with Beijing Capital International Airport, Tongzhou District (通州区: Tōngzhōu Qū), Daxing District (大兴区: Dàxīng Qū), Fangshan District (房山区: Fángshān Qū) and finally Mentougou District (门头沟区: Méntóugōu Qū). Much of the industry in Daxing is related to distribution of food and consumer goods to service Beijing. Daxing is further somewhat noted for its many Hutong like villages for china's many city migrants. moved in from the countryside without a residential permit and seeking employment in Beijing's construction and other industries, most are poor and have to resort to self-built housing, creating communities of little sheds and homes that are a modern reflection of the ancient Hutong created after the City of Beijing was layed to waste by the conquering Mongol Armies in 1215 AD(See: Beijing Sources; History of Beijing). Especially of Interest to those involved with the Beijing City Economy, Beijings Yi Zhuang district is a Part of Daxing District that was developped as a High Technology Development Zone (See Map). The Yi Zhuang Zone is located approximately 16.5 Kilometers (10 miles) to the South-East of central Beijing and by now is home to about 20 more enterprises ranked among the worlds top 500. 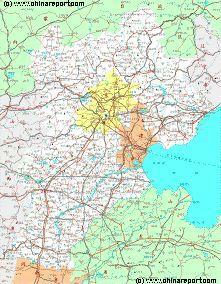 Factories of YiZhuang Zone include Nokia, Coca-Cola, GE and car-maker Mercedes-Benz. Other industries are Pharmaceutical and Medical Companies. The Special Development Zone has seen a rapid growth over the last few years, becoming ranked among one of the countries finest and most important. It is a bit of an elite community. The total added value of high-tech industry in Beijing Yi Zhuang Scientific-technological Development Area accounts for 20% of added value of all industries in Beijing and Yi Zhuan, 15 years ago a small agricultural village, is now a satellite city and white collar workers community near Beijing. Apart from this Yi Zhuang Economic Development Zone is home to Beijing's first and only Grand Prix Circuit. 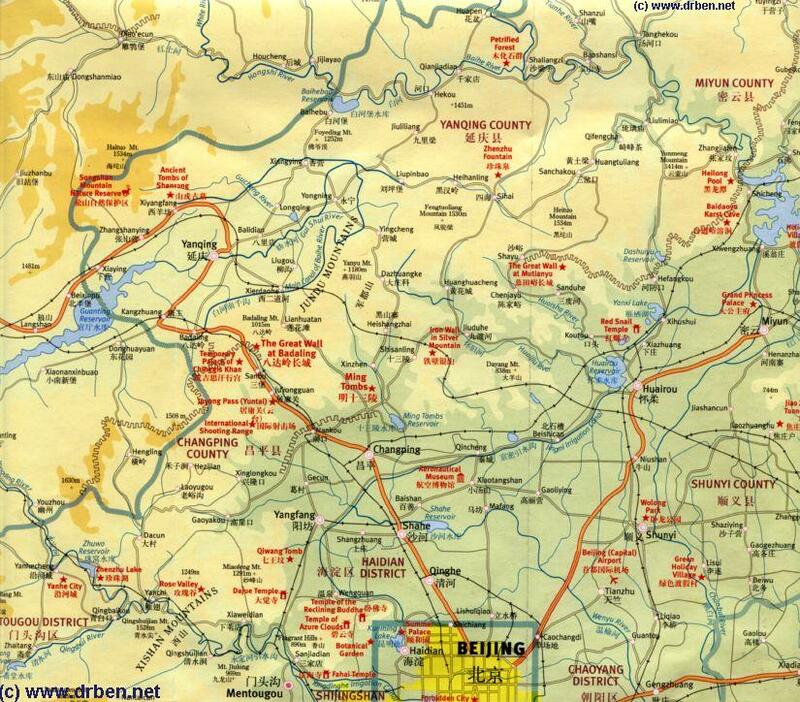 Geographic overview of the Region surrounding Beijing focussing on the Northern Half of Beijing City Province. Check the Map for better understanding of text. One worthwhile site to visit however is the Beijing Milu Yuan Park, a relic site of the Former Hunting Grounds of the Emperors of the Yuan, Ming and Qing Dynasties. Located near the Nan Hai Zi, or souther marshes of Beijing, the Park is home to the Pere David's deer (milu), a strange deerlike creature that became extinct in China toward the end of the Qing Dynasty Era (1644 AD - 1911 AD). Currently the Milu Yuan Park functions as a biological research center that maintains a number of 200 Milu, who can be seen at the Park. Furthermore, some 400 of the odd-looking Milu - the Milu have the neck of a camel, horns of a stag, feet of a cow, and tail of a donkey- have been returned to the wild, reintroducing the species in China. Beijing Milu Yuan is probably the best place on earth to see the Milu Deer in their most natural environment. The Animals graze, enjoy green pastures and forest and have abundant fresh water. Apart from the Deer the Milu Park is home to a great variety of migratory birds who are attracted to the Marsh Lands. As such, the Milu Yuan serves as an important wildlife reserve in North-East China. Other Park atrractions include several exhibitions and a Museum of Extinct Species, warning visitors to have a proper respect for Nature and Wildlife. Travel to Beijing Milu Yuan Park through the Qianmen Tower and Station at the South of The Square of Heavenly Peace (TiananMen Sq.). From Qianmen Bus Station underneath the Towers south side, take Bus Line 729 to Jiu Gong Bus Stop. At Jiu Gong Bus stop switch to mini bus transport for Beijing Milu Yuan. Its only s hort drive. Near and Panggezhuang Village in Daxing many watermelons are grown, a fruit for which the Village is famous watermelons. However, since the Famous Melons are available throughout the cities hutong, this hardly calls for an urgent visit. announced that no more races would be held at Yizhuang Racetrack due to the high cost of preparing the roads for racing. Beijings Yi Zhuang district is a Part of Daxing District that was developped as a High Technology Development Zone. The Yi Zhuang Zone is located approximately 16.5 Km (10 miles) to the South-East of central Beijing and by now is home to about 20 more enterprises ranked among the worlds top 500. Factories of YiZhuang Zone include Nokia, Coca-Cola, GE, Mercedes-Benz, as well as Pharmaceutical and Medical.